What is the Bargaining Council? 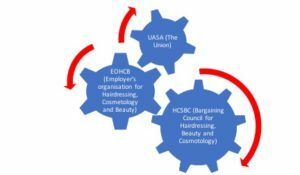 The Bargaining Council regulates employment conditions and provides peace, stability and standards within the Hairdressing, Cosmetology, Beauty and Skin care Industry. It applies to all services performed in any establishment across Southern Africa. What are the functions of the Bargaining Council? Why must MY Spa register to form part of the Bargaining Council? As per the provisions of the Main Agreement no Spa may operate without registering and complying with the Main Agreement, therefore you are obliged to register your establishment. To be effective the Bargaining Council requires active role players in the Industry to ensure efficiency and effectiveness in the Industry. Your employees are your number one asset, therefore invest in them and comply to the provisions of the Main Agreement as it outlines their conditions of services. So, there you have it I know that it seems like a mouthful…. register with the Council it’s the right thing to do!! Spa Sense is here to help YOU we are PASSIONATE about PEOPLE and we WILL ensure that you are sorted from a compliance perspective…. give us a shout on 0799205953 or email leanne@spasense.co.za and we will do the rest. If you need Spa Sense to assist with the registration process and ensure your compliance, then give us a call on 0799205953 and we will take the pressure off you and avoid a possible compliance order imposed by the Council on your Spa.